This week marked the second annual HUBweek, a celebration of art, science, and technology in the Boston area. 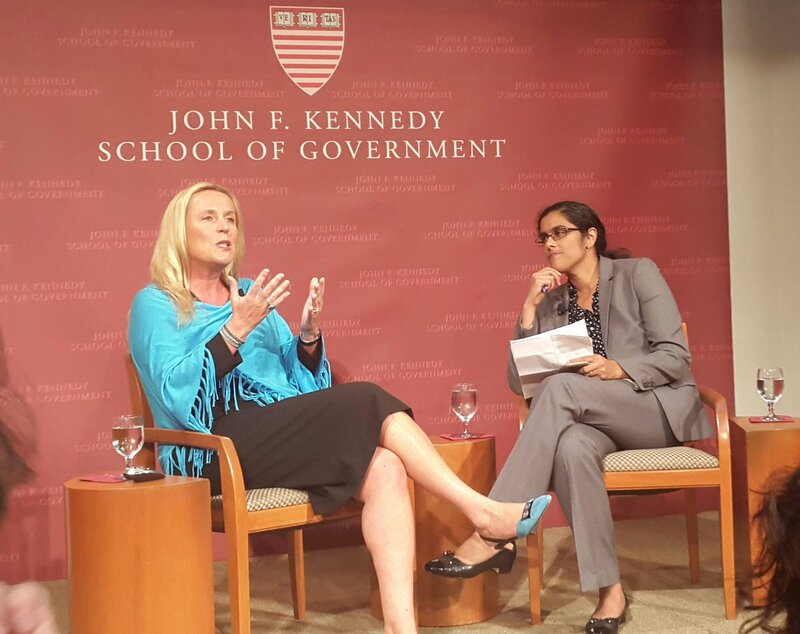 As part of a series on “Ideas to Impact,” Professor Iris Bohnet presented insights from her new book What Works: Gender Equality by Design in conversation with Meghna Chakrabarti, host of Radio Boston on WBUR. Professor Bohnet began by describing Heidi Roizen, a successful Silicon Valley venture capitalist and the protagonist of a case study used by business schools around the country. Researchers at Columbia University provided half of a group of students with the case with Heidi’s name attached; the other half received the same case, but with Heidi’s name replaced with “Howard.” Both male and female students rated Howard and Heidi similarly in terms of competence, but they didn’t like Heidi and didn’t want to work with her. Heidi defies our norms in two ways – she’s not what we expect a venture capitalist to look like, and she defies our conception of what a “good woman” is. Why are our brains doing this? We are all accustomed to certain patterns in this world, and we try to fit our circumstances to these existing patterns. Look at the figure below: are boxes A and B different colors? Initially, it appears that A is much darker. However, when we eliminate the extraneous context, we can see the squares for what they really are – the same color. This is precisely what Professor Bohnet says she is trying to achieve with behavioral design. What can behavioral design do for us that other approaches can’t? Previous studies have suggested little evidence that interventions like diversity training are working. Our minds appear to be pretty stubborn when it comes to implicit bias. Instead of trying to change mindsets, we can more effectively change environments to promote gender equality. In her first question, Ms. Chakrabarti discussed her reaction to hosting Professor Bohnet on her radio show in April. The potential for behavioral design both inspired her and caused a little sadness, as it confronts us with the idea that implicit biases are so difficult to overcome that it’s more effective and easier to make environmental or structural changes. Professor Bohnet replied that there’s good news and bad news associated with the prevalence of implicit bias – the good news is that it’s about all of us (not some “good” unbiased individuals versus “bad” biased ones) – but the bad news is that we’re all biased! Seeing is believing, she says. Changing the environment means that we start to see different role models, counter-stereotypical images, and our brains begin to create new patterns that mitigate implicit bias. In thinking about the A and B squares image, Ms. Chakrabarti asked whether there’s such a thing as removing too much context, such that you no longer see the whole person. Perhaps in implementing interventions like using only structured interviews for hiring, we’re missing out on other diverse perspectives that applicants bring to the table. In response, Professor Bohnet said that we have to continue to measure. We need to understand what factors are predictive of future performance and which are not. Structured interviews can still measure “soft” skills that we think are important. Employers need to be intentional about what values they want to test – be it emotional intelligence or social competence – and incorporate those into questions in their structured interviews. Ms. Chakrabarti asked whether there is data utopianism in this approach, a sense that measurement will solve all of our problems. Professor Bohnet responded that generally, organizations just don’t measure enough to know what works and what doesn’t. Even if it’s not a panacea, we still have a long way to go in terms of collecting data so that we’re not just relying on internal stereotypes. Where we have been able to measure, the data show that these structural interventions are effective in a short amount of time. In the UK and Australia, civil service employees are now evaluated blindly. This intervention started with a pilot test, and since its implementation has doubled the number of women in senior leadership positions. The starting point is to recognize that everything is designed and become more intelligent about how we structure our world. The question and answer session raised a variety of issues, from the potential for gender bias in the presidential debate format, whether it might be possible to design in positive hiring bias toward diverse perspectives, and how to include transgender and gender non-conforming individuals in using behavioral design to promote gender equality. These conversations are an important starting point in generating new research, new innovations, and new behavioral insights.